Dans la bande annonce du 5×14 de Arrow, trois anciennes bad girls de la série sont de retour à Star City et la nouvelle Team Arrow va devoir les maîtriser une nouvelle fois alors qu’elles sont désormais ensemble. 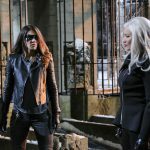 Dans la galerie de photos de l’épisode qui sera diffusé mercredi soir sur la CW, on retrouve notamment le retour de 3 dangereuses ennemies pour le Green Arrow avec China White, Cupid et Lyza Warner mais Dinah semble ne pas avoir peur de les affronter toutes les trois. 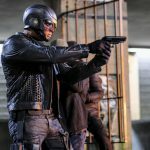 Je vous propose de découvrir ci-dessous les photos promos du 5×14 qui sera intitulé « The Sin-Eater ». 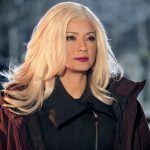 Arrow — « The Sin-Eater » — Image AR514b_0261b.jpg — Pictured: Kelly Hu as China White — Photo: Robert Falconer/The CW — ÃÂ© 2017 The CW Network, LLC. All Rights Reserved. Arrow — « The Sin-Eater » — Image AR514b_0139b.jpg — Pictured: David Ramsey as John Diggle/Spartan — Photo: Robert Falconer/The CW — ÃÂ© 2017 The CW Network, LLC. All Rights Reserved. Arrow — « The Sin-Eater » — Image AR514b_0152b.jpg — Pictured (L-R): Juliana Harkavy as Tina Boland/Dinah and Kelly Hu as China White — Photo: Robert Falconer/The CW — ÃÂ© 2017 The CW Network, LLC. All Rights Reserved. 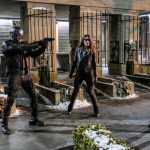 Arrow — « The Sin-Eater » — Image AR514b_0145b.jpg — Pictured (L-R): David Ramsey as John Diggle/Spartan, Juliana Harkavy as Tina Boland/Dinah, and Kelly Hu as China White — Photo: Robert Falconer/The CW — ÃÂ© 2017 The CW Network, LLC. All Rights Reserved. Arrow — « The Sin-Eater » — Image AR514b_0132b.jpg — Pictured (L-R): Juliana Harkavy as Tina Boland/Dinah and Kelly Hu as China White — Photo: Robert Falconer/The CW — ÃÂ© 2017 The CW Network, LLC. All Rights Reserved. 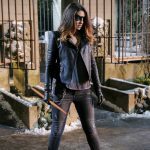 Arrow — « The Sin-Eater » — Image AR514b_0100b.jpg — Pictured: Juliana Harkavy as Tina Boland/Dinah — Photo: Robert Falconer/The CW — ÃÂ© 2017 The CW Network, LLC. All Rights Reserved. Arrow — « The Sin-Eater » — Image AR514b_0083b.jpg — Pictured (Top): Juliana Harkavy as Tina Boland/Dinah. 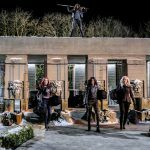 Bottom (L-R): Amy Gumenick as Carrie Cutter/Cupid, Rutina Wesley as Liza Warner, and Kelly Hu as China White — Photo: Robert Falconer/The CW — ÃÂ© 2017 The CW Network, LLC. All Rights Reserved. Arrow — « The Sin-Eater » — Image AR514b_0023b.jpg — Pictured (L-R): Amy Gumenick as Carrie Cutter/Cupid, Kelly Hu as China White and Rutina Wesley as Liza Warner — Photo: Robert Falconer/The CW — ÃÂ© 2017 The CW Network, LLC. All Rights Reserved. 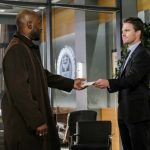 Arrow — « The Sin-Eater » — Image AR514a_0137b.jpg — Pictured (L-R): Adrian Holmes as Captain Frank Pike and Stephen Amell as Oliver Queen — Photo: Robert Falconer/The CW — ÃÂ© 2017 The CW Network, LLC. All Rights Reserved. 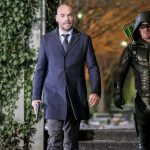 Arrow — « The Sin-Eater » — Image AR514b_0271b.jpg — Pictured (L-R): Paul Blackthorne as Quentin Lance and Stephen Amell as Oliver Queen/The Green Arrow — Photo: Robert Falconer/The CW — ÃÂ© 2017 The CW Network, LLC. All Rights Reserved. 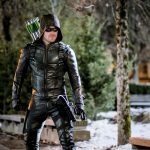 Arrow — « The Sin-Eater » — Image AR514b_0182b.jpg — Pictured: Stephen Amell as Oliver Queen/The Green Arrow — Photo: Robert Falconer/The CW — ÃÂ© 2017 The CW Network, LLC. All Rights Reserved. 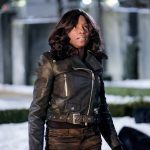 Arrow — « The Sin-Eater » — Image AR514b_0244b.jpg — Pictured: Rutina Wesley as Liza Warner — Photo: Robert Falconer/The CW — ÃÂ© 2017 The CW Network, LLC. All Rights Reserved. 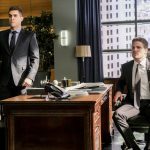 Arrow — « The Sin-Eater » — Image AR514a_0277b.jpg — Pictured (L-R): Josh Segarra as Adrian Chase and Stephen Amell as Oliver Queen — Photo: Robert Falconer/The CW — ÃÂ© 2017 The CW Network, LLC. All Rights Reserved. 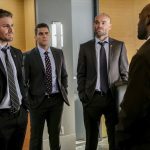 Arrow — « The Sin-Eater » — Image AR514a_0083b.jpg — Pictured (L-R): Stephen Amell as Oliver Queen, Josh Segarra as Adrian Chase, Paul Blackthorne as Quentin Lance and Adrian Holmes as Captain Frank Pike — Photo: Robert Falconer/The CW — ÃÂ© 2017 The CW Network, LLC. All Rights Reserved. 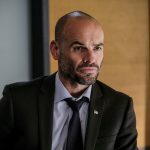 Arrow — « The Sin-Eater » — Image AR514a_0040b.jpg — Pictured: Paul Blackthorne as Quentin Lance — Photo: Robert Falconer/The CW — ÃÂ© 2017 The CW Network, LLC. All Rights Reserved.